GREAT PRICE FOR HOT OLD TOWN! Beautiful extended width Townhome in Old Town Village East. Lovely fenced garden welcomes you to this spacious and walk to everything location. Ground Level features a large Foyer, Study and hard-to-find Attached Two Car Garage. 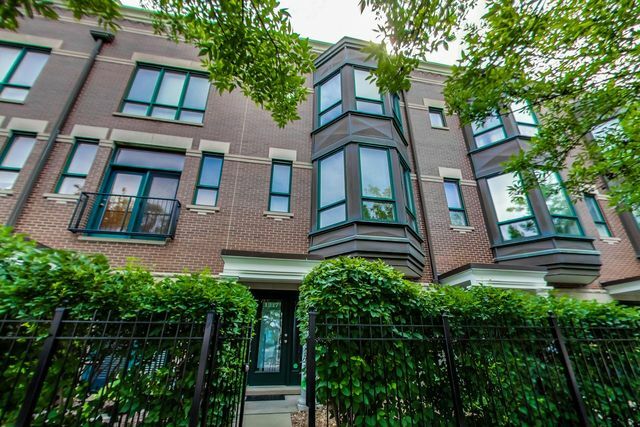 Main Level features 10 ft. ceilings, triple crown molding, diagonally installed HW flooring. Generous Living Room w/ gas fireplace, bay window, Dining Room, large Kitchen w/ breakfast Island, SS appliances, granite, 42" maple cabinetry, large Pantry. 12' x 5' Balcony overlooks courtyard. Second Level w/ large Master Suite has W/I closet and organizers, Full Bath w/dual vanities, soaking tub and separate oversized shower. Second BR w/ ensuite Full Bath and adjacent Laundry. Third Level is currently used as the 3rd BR or can be used as a Rec Room. Plumbed for wet bar w/ 18' x 7' rooftop deck, it is the perfect area for entertaining guests. LOW ASSESSMENTS - $145/Month. Walk to shopping, purple/red/brown lines, Loop and the Lake! Property information last modified by seller on Saturday, December 01, 2018, 12:30 PM CST. Information Deemed Reliable But Not Guaranteed. Unauthorized duplication, use, or linkage is prohibited. The information on this web site is for personal, non-commercial use and may not be used for any purpose other than to identify prospective properties consumers may be interested in purchasing. Monthly Payment Calculator results are for illustrative purposes only, not a financing opportunity; calculations assume a 30-year fixed-rate mortgage and do not include closing and other costs. Property Tax on NEW properties is estimated at 1.5% of Listing Price for payment calculation purposes; actual value may be higher or lower.